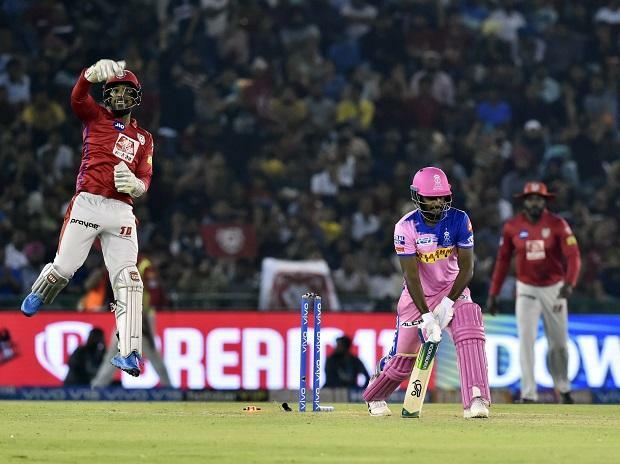 In match 32 of VIVO Indian Premier League (IPL 2019), Kings XI Punjab (KXIP) beat Rajasthan Royals by 12 runs at PCA IS Bindra Stadium in Mohali, Chandigarh on Tuesday. This was KXIP’s 5 win in 8 matches and now they moved to the 4th spot of IPL points table 2019. Earlier, opener KL Rahul cracked a patient fifty before a terrific cameo by skipper Ravichandran Ashwin powered Kings XI Punjab to a challenging 182 for six against Rajasthan Royals in a reverse IPL fixture. Rahul, who was named in the World Cup squad on Monday, recovered after a slow start to post a 47-ball 52 studded with three fours and two sixes. He was ably supported by David Miller (40 off 27) as the duo shared a 85-run stand to lay the foundation. Ashwin then blasted a four-ball 17 in the last over as KXIP posted a good total on board. Pacer Jofra Archer (3/15) returned with an exceptional three-wicket haul to emerge as the best bowler for the Royals. Archer then had him caught behind by Sanju Samson in the sixth over as KXIP were 39 for one in the first powerplay overs. Playing his first IPL game this season, New Zealand's Ish Sodhi was then introduced into the attack and Mayank Agarwal (26 off 12) clobbered him for a six in the fourth ball. Agarwal then picked up a four and a six off Shreyas Gopal before Sodhi returned to remove him. Trying to play a slog sweep, Agarwal was caught by Archer at long-on. Left stranded on the other end, Rahul tried to steady the ship with Miller, who came into the side due to the last-minute ankle injury of Moises Henriques. The duo took singles and twos before Rahul finally scored his first boundary when he lifted a Unadkat delivery across the mid-off region. In the 14th over, Rahul and Miller exploded after bringing up the hundred for KXIP. The duo amassed 19 runs off Sodhi's over, his last, with Rahul smoking a massive six over deep square leg and Miller thumping one over long-off. Gopal then bowled an economical over next to compete his quota of four overs. Rahul perished early in the 18th over off Unadkat and Archer then bowled a superb over, removing Nicholas Pooran (5) and Mandeep Singh (0). Miller too was sent packing early in the 20th over by Kulkarni.